It’s a Clickin’ Summer Giveaway! Enter to win 2 Nikon D3200 Cameras. You will receive one camera for you AND one for a friend! Each camera is valued at $529.00 making this prize package worth over $1,000! It’s a clickin’ summer giveaway! 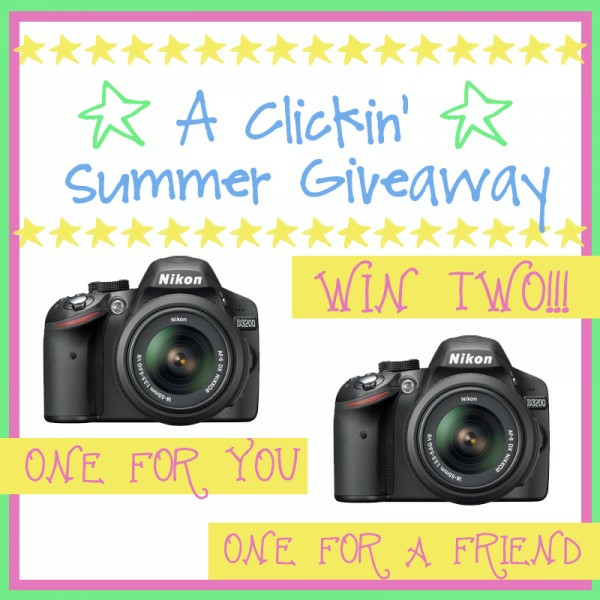 Win a Nikon Camera for YOU and a FRIEND! You read that right – 2 free cameras! Here is the link to the exact cameras you will receive. Now you’ll be able to take pictures of each other….or capture sweet summer memories of your family. It’s easy to enter. Don’t have an instagram account? No worries…go ahead and set one up here. They are free. Win ONE – Give ONE Time to capture Summer Memeories. 2 Nikon Cameras! Thanks to all of the sites participating to make this giveaway possible.Good luck…and don’t forget to share the giveaway for extra entries!